This was a historical moment: the agreement between „Young Caritas in Europe“ and „Caritas Europa“ to organize the big conference in Georgia about the participation of volunteers! 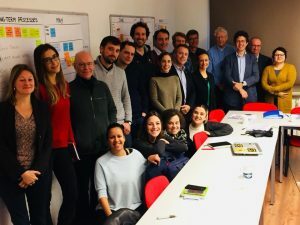 youngCaritas in Europe is a network consisting of five international youngCaritas’ from France, Germany, Luxembourg, Austria, Switzerland and two local youngCaritas located in South-Tyrol as well as in Vienna. All together we are appointing for global solidarity.As a network we are providing the opportunities for young people in Europe to get information, to exchange and socially participate and engage since 2014. With the financial help of Erasmus+ and Movetia, which started in November 2017, we are able to expand our strategic partnership under the topic “you are welcome- young ideas for a solidary world”. Thereby we are engaging for Europe and a as a whole in concert acting community in Europe. You want to become an active member of youngCaritas in Europe? By working all together we can change the world.